Q: What is the most important factor to consider when selecting rainwater systems? Q: What else should builders think about when selecting rainwater systems? Q: How do you work out how much capacity the system will need? Q: What can be done to minimise installation time on projects? Q: Sustainability is an emerging trend among tradesmen keen to minimse the environment footprint of the properties they’re working on. Is there anything they need to bear in mind from a drainage point of view to help them meet this goal? Q: Why is it so important for builders to think carefully before choosing a rainwater system? In this Q&A, Above Ground Product Manager at Wavin, Steve Skelton gets to the bottom of some of the most common questions about rainwater systems and explains how builders can ensure the best possible results for the homes that they build. Excessive rainfall and flooding are becoming more common in the UK, making rainfall an important consideration for builders. Rain water systems which direct rainfall from the roof area of a building towards drainage outlets play an important part in the overall management of rainwater for an area. There are a few things that builders and developers need to bear in mind but, above all, it’s crucial to ensure that the system specified offers the right capacity to cope with the amount of water discharged from the roof of a home. A systems capacity depends on several factors including the gutter capacity (how many litres of water can flow through the gutter every second), whether the gutter is level, at an angle or a ‘straight run’, and how many drainage outlets it has in it. The location of each outlet – whether it is at the end or centre of the gutter is also important. The look of rainwater system is becoming increasingly important, due to its effect on the overall aesthetics of a property. Products which feature concealed sockets designed to cover rough-cut pipe edges and unobtrusive hanging brackets, can help in this regard, giving the guttering a clean, neat look from ground level. Pipes with invisible seams can also enhance the look of the property. Their sleek straight design can help make the drainage system an integral part of the building design, rather than a functional add-on. The required capacity will depend on the area of the roof plan (its length multiplied by width) and the pitch factor (whether it is shallow or steep). There’s a calculation you can do to work this out. The roof plan area x the roof pitch factor = the capacity of the system. You should take into account the average rainfall in the local region. Climate can vary over a very small area, and a home may require a gutter system with a greater capacity than a similar property just a few miles away. 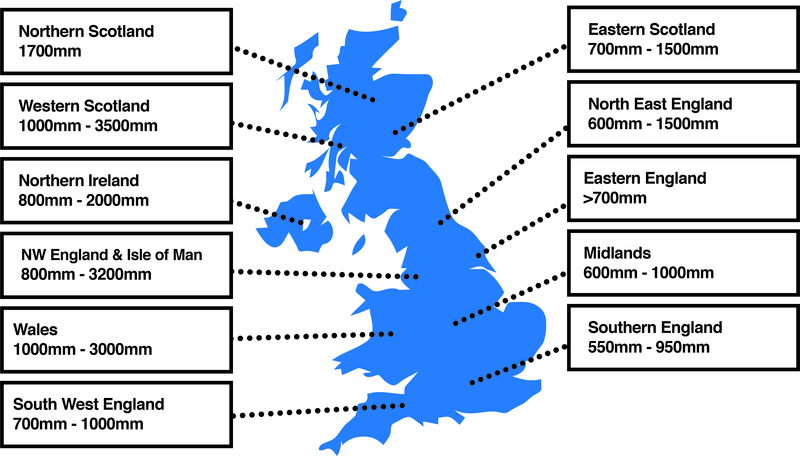 High altitude areas in particular, such as those at the Lake District, Snowdonia or the highlands, tend to be in the wettest parts of the UK, so homes in these regions will need systems that can handle a large quantity of water. For such properties, high capacity products like Wavin’s Deepline and Stormline will be most suitable. Builders are under constant pressure to deliver high quality results while meeting strict deadlines, so products that enhance efficiency are vital. Choosing a high capacity system over a smaller alternative can really help here, as it requires fewer downpipes. This can help speed up the installation process and help to minimise labour costs as well. In addition an increasing number of guttering products are being designer with ease of installation in mind. Osma systems, for instance, feature a Flexiclip, which is designed to make it easier to connect the gutter to its fixing. All installers need to do is flex the clip, rather than the entire component, saving time during installation, and helping to ensure a permanently watertight joint. Choosing a rainwater system with an appropriate capacity for the climate needs of a site is crucial to minimising the environmental footprint of a home. Guttering is the first line of defence against flooding during stormy weather and the right system, in combination with a well-designed sustainable drainage system (SuDS), can help to optimise stormwater manager on the site. This, in turn, can protect local habitats from the risk of flooding. The guttering of a home should never be an afterthought, it is an integral part of a home. It’s vital to help protect a property from the leaks and minimise the flooding. Moreover, it has the potential to impact both the aesthetics and environmental footprint of the building it is fixed to. By carefully considering the drainage needs of a home at the design stage, it is possible for house builders to ensure that the rain water system they select doesn’t just offer optimum performance over the lifetime of a property, but is an attractive and sustainable feature as well. From half-round guttering that integrates seamlessly to residential, commercial and industrial buildings, to siphonic roof drainage systems for flat roofs and complex roof areas, we offer a wide range of solutions to capture rainwater.